With the weather getting warmer, it’s a great time to dust off that grill and cook some tasty barbecue for your family and friends. Unfortunately, most of our grills are a complete mess from a prior year of summer time fun. You probably want to clean it, but there’s something that anyone preparing to clean their BBQ grill should be aware of. The metal brush you use for cleaning could be a serious health concern. 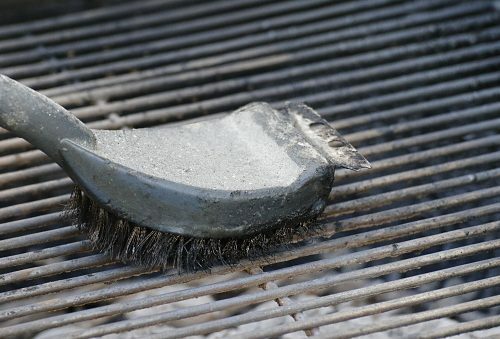 The metal bristles found on most grill brushes have the tendency to snap off, experts warn. Chances are, you are using old and rusted cleaning equipment that has seen better days, and this increases the chance for those fine strands of metal to land on the grate, eventually finding their way into your food and into your body. “The worst are the bristles that make it all the way down to the intestines. If it gets to your intestine and then perforates through the wall of your intestine, that is scary. We saw one migrate into the liver and cause a liver infection that had to be treated, and we’ve had bristles that pierced the intestines at multiple points and had to be retrieved surgically,” said Dr. David Grand, an associate professor of diagnostic imaging at the Warren Alpert School of Medicine at Brown University in Providence, R.I.
Dr. Grand’s hospital saw six cases of grill brush bristle ingestion between March 2011 and June 2012. Three of the cases had these small wires stuck in the intestinal tract requiring surgery or colonoscopy for removal. The other three had the wires stuck in their throat, which had to be removed using a tube that ran down the throat. It is estimated that 80,000 people each year wind up in the emergency room due to accidental ingestion of a foreign object. Brush bristles are included in this group. When a fine sharp object travels through the digestive system, it can present with severe abdominal pain. But sometimes a person may not display any symptoms at all until much later. Part of the problem is that when a person comes in with stomach or throat pain, a metal bristle is not the first thing doctors think of. Imaging tests, like a CT scan, can even miss the bristles owing to their small size. If you plan on grilling in the near future, it may be in your best interest to toss your old cleaning brush. Medical experts recommend using grill-cleaning stones and bricks or brushes made of nylon bristles that are much safer and easier to spot.